The "threads" of a cultural "fabric" are its language. Learning a language other than one’s own native language is not a simple task unless you are some sort of a multiple language genius. Most of us, including me, are not. The second paragraph of the "Introduction" in How Really to Learn Spanish is the mirror image of me before I enrolled in Bilingual America. 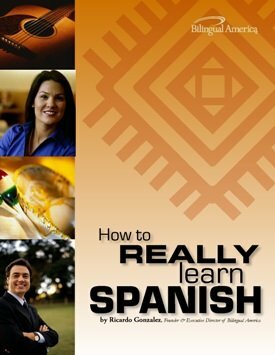 My thought when I finally decided to try this program was: "This is the LAST time I am going to try to learn the Spanish language! If this doesn’t work, I give up!" I have had a pleasant surprise. This non-traditional program has taken the threads of the Spanish language and woven them into a progressive learning fabric that works extremely well for the average learner. As a professional educator who has made several attempts to learn Spanish aside from my demanding professional life, Bilingual America has truly given me a gift! Read this little book and apply what you have learned. It purports a language-learning style that makes sense. Seriously following the instructional patterns in the Bilingual America language program, you, too, can learn this beautiful language Jane M. Madsen,D.Ed.